One of the major complaints people make about EVs is that they have short ranges and long charging times. The second generation Toyota Rav4 EV sold from 2012 to 2015 was no stranger to that complaint, seeing a range of just 103 miles. The Rav4 EV was built in a partnership between Toyota and Tesla, and a total of 2,489 units were built. 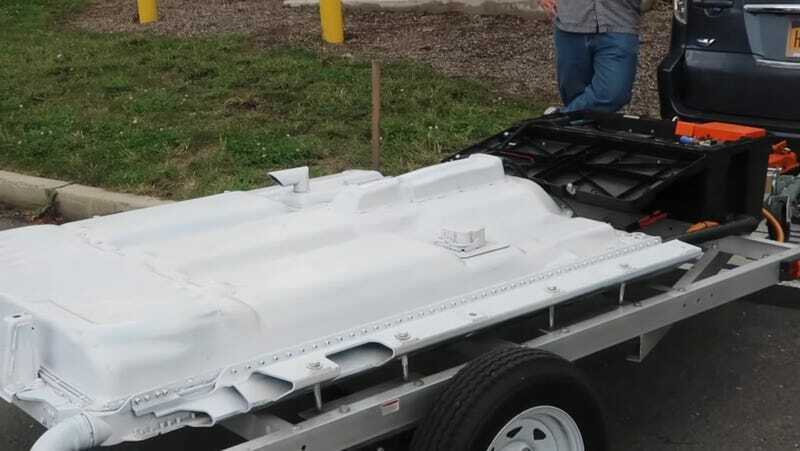 This enthusiastic owner wanted to increase the range of his Toyota, and built this simple trailer solution to double his battery capacity, nearly doubling his range, despite the trailer’s extra 1000 pounds. This trailer is hardly the most attractive thing in the world, but this is a case of function over form, certainly. The second battery array, also from a Rav4 EV, is wired in parallel to the original pack, which increases the amount of storage, without affecting voltage or power output. That’s the great thing about home-built EV solutions like this; enthusiasts are able to experiment with what works and what doesn’t. In some ways, EVs are simpler to control than modern ICE cars, making DIY upgrades possible again. Electric propulsion is the new wild west of automotive tuning, whether it be adding hybrid power to non-hybrid cars, or boosting electric cars to perform better than factory. This is old-school hot rodding brought into the modern era. The trailer retains the original Toyota floor pan casing, making it likely as safe as it would have been bolted into the Rav4 body. I’m not convinced that high-voltage cables should be hanging out in the wind as seen in the connection between the trailer and the car, but everything in life is a calculated risk, right? What’s the worst that could happen?